WWE’s planned Network event from Australia, which was briefly mentioned by Michael Cole on Monday Night Raw in March, has now been confirmed. 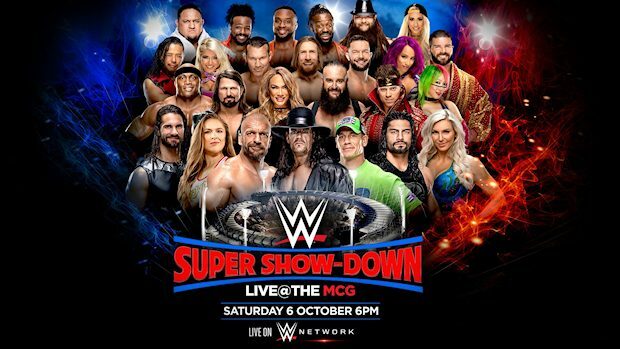 WWE announced this morning that the event, titled WWE Super Show-Down, will take place at the Melbourne Cricket Ground in Melbourne, Australia on Saturday, October 6. Following WrestleMania 34 and the Greatest Royal Rumble, this will be WWE’s third stadium show of 2018. The first match for the show has also been announced, with Triple H set to take on The Undertaker for the first time since WrestleMania 28 in 2012. It’s being promoted as the final match between the two. John Cena, Ronda Rousey, Shane McMahon and Big Show are among those advertised for WWE Super Show-Down. In this video announcing the show, Vince McMahon says Kurt Angle will also be there. Seth Rollins, Roman Reigns, Randy Orton, Nia Jax, AJ Styles, Charlotte Flair, Daniel Bryan, The Miz, Sasha Banks, Alexa Bliss, Bray Wyatt, Bobby Lashley, Braun Strowman, Asuka, Shinsuke Nakamura, Finn Balor, Bobby Roode, Samoa Joe, The New Day, Carmella, Peyton Royce and Billie Kay are also advertised, along with more WWE Superstars from Raw and SmackDown LIVE. WWE is also advertising Shawn Michaels for WWE Super Show-Down. 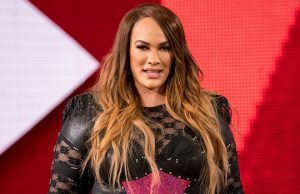 Though Michaels has discussed potentially being open to one more match under the right circumstances, it wasn’t specified whether he would just be making an appearance or not. WWE Super Show-Down will stream live on the WWE Network and be available on pay-per-view globally. It’s taking place three weeks after WWE Hell in a Cell and two weeks before WWE TLC.